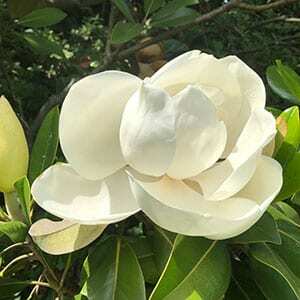 Magnolia grandiflora are a large evergreen tree from the southern areas of North America. Also known as the ‘Bull Bay’ Magnolia as well as the ‘Southern Magnolia’. The species is a large growing tree with glossy green foliage and large white flowers. Foliage is also backed with a ocher brown felty texture, giving the plant an extra interest. The actual species is a large tree to over 25m in height with a broad crown to 15m, however it is the smaller growing cultivars that are offered by wholesale growers in Australia. Magnolia grandiflora and its cultivars are a versatile tree, they grow well in a wide range of climates and in Australia will grow from Tasmania through to tropical Queensland. They do require a good humus rich deep soil and are best where they receive some rain through the hot summer months. However, once established they are a remarkably hardy and resilient tree. Used as large shade trees, feature trees as well as for screening and hedging they are easily pruned and are very popular with landscapers. Magnolia grandiflora will grow well in containers and large specimens have been installed outside the Casino in Melbourne. The height varieties greatly from cultivar to cultivars, the smaller growing types are easily kept to 6m, larger types vary from 15 to 25m. Growth rate and final height will depend on climate as well as the soil and moisture availability. All will grow faster in warmer climates, many are grown in and around Sydney until they reach a good height and then shipped south to Melbourne. Growth rate in Sydney outstrips that in Melbourne by a good margin. ‘Alta’ a columnar or upright form, chance seedling from M.grandiflora Hasse.